He wears the unique embroidered garment, a pair of cuffed boots, and a gold and ruby circlet. He is armed with a steel sword. 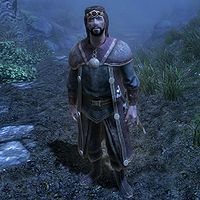 If you encounter him in Sovngarde he will tell you that he feels sorry for his wife, saying, "When Ulfric Stormcloak, with savage Shout, sent me here, my sole regret was fair Elisif, left forlorn and weeping. I faced him fearlessly - my fate inescapable, yet my honor is unstained - can Ulfric say the same?" If you encounter him before Alduin has been defeated, Torygg may say: "Beware! The World-Eater waits within the mist!" or "Do you know the way? I'm weary and lost." or "Turn back! Before he finds you!" or "There is no escape. Courage is useless." If you encounter him after Alduin is defeated, Torygg may say: "The mist is gone! A glorious day!" or "The World-Eater is dead! The way is now clear!" or "All hail the Dragonborn! Hail him/her with great praise!" or "You saved us all. We will sing of you forever." Sovngarde: Seek out Alduin within Sovngarde. This page was last modified on 15 May 2018, at 18:00.